1. You will be able to turn your passion for birth into skills that will support perinatal families. 2. You will be ready to work for positive change one motherbaby at a time. 3. You will be giving yourself the gift of a new career. 4. You will be working with Julie Brill, CCCE, CLD who has supported thousands of perinatal families and mentored hundreds of birth professionals. 5. You will meet an amazing, diverse group of people who are passionate about working with perinatal families. 6. 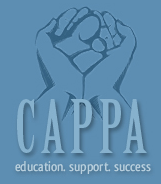 You will be taking a major step in becoming CAPPA certified. 7. You will get to engage in hands on practice. 8. You will learn about publicity and how to move your birth business forward. 9. You will be welcomed into the CAPPA sisterhood. 10. You will get inspired.